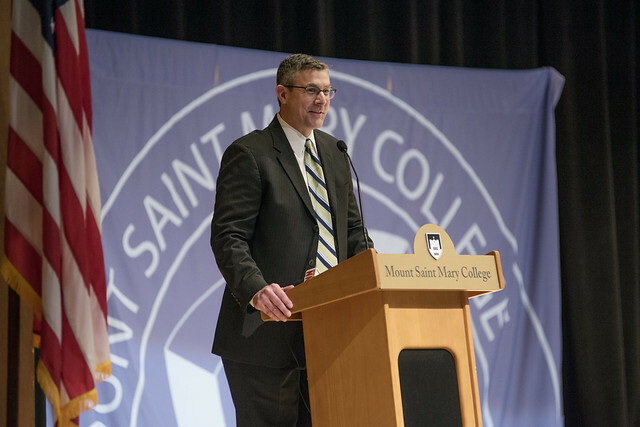 Following a national search and valuable input from the Mount community, Charles Frank, Chair of the Board of Trustees at Mount Saint Mary College, announced today that Dr. Jason N. Adsit has been named the next president of the college. In a unanimous vote, the Board has selected Dr. Adsit as the Mount’s seventh full-time president, succeeding interim president Dr. David A. Kennett, who was appointed in August of 2016. Dr. Adsit will begin his service at the Mount on June 1, 2018. Dr. Adsit joins Mount Saint Mary College from D’Youville College in Buffalo, N.Y., where he served as Dean of the School of Arts, Sciences & Education, as well as Director of the Educational Leadership Doctoral Program. As chief academic officer, Dr. Adsit oversaw all undergraduate and graduate programs in the School, including the departments of Biology & Mathematics, Business, Chemistry, Education, and Liberal Arts. Among many accomplishments there, Dr. Adsit developed and implemented undergraduate programs in Spanish and Religious Studies, graduate programs in Curriculum and Instruction and Anatomy, a fully-online MBA program, and a broad range of new minors; secured more than $500,000 in grants for programs to aid the college and the community; and fostered new enrollment partnerships, such as articulation agreements with Canisius College in Buffalo, N.Y.; the Orchard Park Central School District in West Seneca, N.Y.; and JBCN International Schools in Mumbai, India. The 15-member Presidential Search Committee included Mount trustees, faculty members, administrators, an alumnus, and a student. The committee was co-chaired by Mount Board Vice-Chair Sister Margaret Anderson and Trustee Anna Halpine. The Mount Saint Mary College community extends its heartfelt thanks to Interim President Dr. David Kennett for his many contributions over the past two years, including his steadfast dedication to the Mount’s continued success; the wellbeing of students, faculty, and staff; and the enrichment of the surrounding community. Before coming to Mount Saint Mary College, Dr. Jason N. Adsit served D’Youville College in Buffalo, N.Y. as Dean of the School of Arts, Sciences & Education and Director of the Educational Leadership Doctoral Program. He oversaw all undergraduate and graduate programs in the School – five programs in total. During his tenure at the University of Rochester in Rochester, N.Y., Dr. Adsit took the role of Associate Provost for Academic Administration, where he managed the University’s compliance and regulatory affairs with state agencies and national organizations in the design and implementation of new programs. Earlier in his career, Dr. Adsit served as Director of the Teaching and Learning Center at SUNY Buffalo and as Assistant Dean for Institutional Research and Assessment at Johns Hopkins University in Baltimore, Md. Dr. Adsit has written many scholarly articles on a variety of topics, with his work appearing in the National Teaching and Learning Forum, The American Journal of Pharmaceutical Education, and the Journal of Educational Technology Systems, among others. For nearly a decade, he has been a professional reviewer for the Journal of Online Learning and Teaching (JOLT), American Journal of Distance Education (AJDE), Educational Technology and Society, and Journal of University Teaching and Learning Practice. He is also an accomplished speaker, most recently presenting “DIY Assessment of General Education” at the Drexel University Assessment Conference. Dr. Adsit discussed online assessment at the 2015 Ithaca College EdTECH Day and gave the keynote address – “Assessing Student Learning and Engagement Inside and Outside the Classroom” – at the WNY Assessment Consortium at SUNY-Brockport. Dr. Adsit earned a doctoral degree in Philosophy from the State University of New York at Buffalo and a bachelor’s degree in Philosophy from American University in Washington, DC. Mount Saint Mary College is a private, co-educational, four-year liberal arts college, located in Newburgh in the mid-Hudson Valley region of New York State. It was founded in 1959 by the Dominican Sisters. The campus overlooks the Hudson River, halfway between New York City and Albany. About 2,700 men and women are enrolled in more than 50 undergraduate programs and three graduate degree programs. The Knights compete in NCAA Division III athletics in the Skyline Conference.